The Regional Governor of Burgas protects thugs in the “Ropotamo” natural reserve; he refused to assist the Ministry of Environment and Waters (MEW). The deadline for the company “Venis Marine” to voluntarily leave the “Ropotamo” natural reserve is expiring and after that the Regional Inspectorate of the Environment and Waters (RIEW) in Burgas will initiate eviction. This is what MEW’s press office told Bivol. However, this cannot happen without the support of the Governor, who has so far refused to expel violators from the territory that is public State property. Two years ago, the Ministry terminated the contract of “Venis Marine” for boat tours on the lower reaches of the “Ropotamo” river. However, the company continued to imperturbably dispose of the reserve, to provide boat tours for tourists and make money from the actually illegal services while the State did not receive even one lev from the concession. MEW has won all administrative legal cases and is unsuccessfully trying to evict “Venis Marine” which cites an absurd civil case in order to remain in the reserve. Imagine that your driver’s license is suspended over a serious offense; you lose the appeals and have to appear in the traffic police to submit the document, but you file instead a civil lawsuit against the traffic police to prove that your driver’s license was valid before the offense took place. And you refer to this case as grounds to continue driving with a revoked license. The situation is similar to the dispute between “Venis Marine” and MEW. The contract was terminated long ago because of drastic violations; the Supreme Administrative Court (VAS) definitively ruled that the contract is not valid. However, the company filed a civil case to prove that the contract has been valid before the infringement. The most absurd detail here is that the Regional Governor of Burgas Vulcho Cholakov, who is a lawyer, fully supports the thesis of “Venise Marine” and refuses to assist RIEWs until there is a rule in the civil case. So, without a contract the company continues to illegally transport people and make money to the detriment of the State, while the executive power ignores VAS’ rules and is in reality helping offenders to act against Statehood. However, those behind “Venis Maria” are not some random people. An investigation of Bivol revealed that it belongs to individuals close to drug lord Hristoforos Amanatidis AKA Taki. “Venis Marine” is owned by the registered in the UK “Stoymenov Group Limited” Ltd. One of the “gauleiters” (senior regional party functionary in nazi Germany – editor’s note) of late ringleader Georgi Iliev on the Black Sea coast, Veselin Stoymenov, is believed to be the owner of the British offshore company. He is known to be one of the people who took over the business of VAI Holding after the murder of Iliev in the Sunny Beach resort in the summer of 2005. This same company is the sole owner of “RV Investment” Ltd, which is co-owner with Hristoforos Amanatidis Taki of the Nessebar-based company “Intertour,” a reference in the Trade Registry shows. As one of the direct “heirs” of Georgi Iliev, Stoimenov also has a hold on all of the entertainment and services on the north beach in Sunny Beach. Just a week ago, a massive inspection of the Ministry of Regional Development and Public Works found a number of violations of the concession contract and in the activities precisely on this beach and issued citations over them. The contracts with “Venis Marine” were signed by the former head of the Regional Inspectorate for Environment and Waters in Burgas, Boycho Georgiev, who became infamous in the scandal known as “Dunes Gate” for the speedy issuing of construction permits in protected areas. The company immediately became notorious when in the spring of 2013 it built illegally a restaurant and poured concrete in the reserve, which was also revealed by Bivol. Because of the blatant violation and after the scandal over the illegal construction erupted, the contract of the company was terminated. In a letter with reference number 6177 from August 12, 2013, the Regional Inspectorate of Environment and Waters in Burgas informed the company that due to the illegal construction, it was unilaterally terminating the agreement for the boats that was signed on October 24, 2012, and ordered “Venis Marine” to vacate in full the premises which are exclusive State property. The then Regional Governor of Burgas, Pavel Marinov, from the Bulgarian Socialist Party, BSP, (exposed by Bivol as a secret partner and person close to senior Russian officials in the defense sector) refused assistance for maintaining order in the State reserve. In early 2014, Georgiev’s procedure for selecting “Venis Marine” was declared unlawful by the Burgas Administrative Court. The decision was upheld by the Supreme Administrative Court, with Decision 4494 / April 22, 2015, which is final; cannot be appealed and clearly stated that no private company has the right to use in any way the protected area because the mere bid has been conducted by Boycho Georgiev under an unlawful procedure. Immediately after the final rule, the Director of RIEW Burgas issued Order № 64 from April 29, 2015 to apply a Coercive Administrative Measure (PAM) to immediately stop all tourist services “Ropotamo Boat Tours” in the reserve “Ropotamo” performed by “Venis Marine” LTD. The company was invited to vacate the “Ropotamo” reserve and all contracted facilities. RIEWs returned to the penny the concession fee for 2014 paid by “Venis Marine” because for the environmental inspectorate the contract is terminated. This was explained by a MEW spokesperson, after Bivol asked how much money has the State received from this concession in 2014. The Ministry is adamant that the performed tourist service is illegal and comes to arbitrariness. And since the company is working illegally in the “Ropotamo” reserve, there is no legal way for the State to receive money from the “boat tours” service. We had a rerun in 2015. “Venis Marine” moved to the pier with the catamarans and resumed the illegal service for which the State gets nothing. RIEWs attempted once again to expel the company from the reserve. And once again, before the start of the season, the Regional Governor of Burgas did not cooperate with the environmental inspectorate. Only now it was not the left-wing Pavel Marinov, but the right-wing Vulcho Cholakov. This refusal, no matter on what grounds, has very real monetary terms – the new season will bring back hundreds of thousands in revenue for the company-offender and not even one lev for the State. #Who will be liable in case of an accident? The most serious question that has no simple answer in the total legal chaos in the State is who will bear responsibility if, God forbid, there is an accident with the boats on Ropotamo? Currently, there are no tickets to board them and to use the service, but cash receipts are used instead. However, the fact that this is water transport is not written on the latter and it is not clear that this is actually a water transport ticket. “Venis Marine” may issue such cash receipts for the beach umbrellas or entertainment in Sunny Beach. According to maritime experts, it is mandatory in cabotage or other river and sea transport to issue an official fiscal document with specific indication that it is also a boarding pass for the vessel. Otherwise, in an accident similar to the misfortune of our compatriots in Ohrid Lake a few years ago, payment of damages can be problematic. The insurance company DZI that has a contract with “Venis Marine” refused to answer specific questions of Bivol if the insurance of this carrier is valid in the conditions of breaches of the law and of the contractual relationship with the State. We can only hope that nothing bad would happen to tourists who dare to board the boats on Ropotamo, because then all State institutions in charge will start to frantically transfer responsibility to one another. 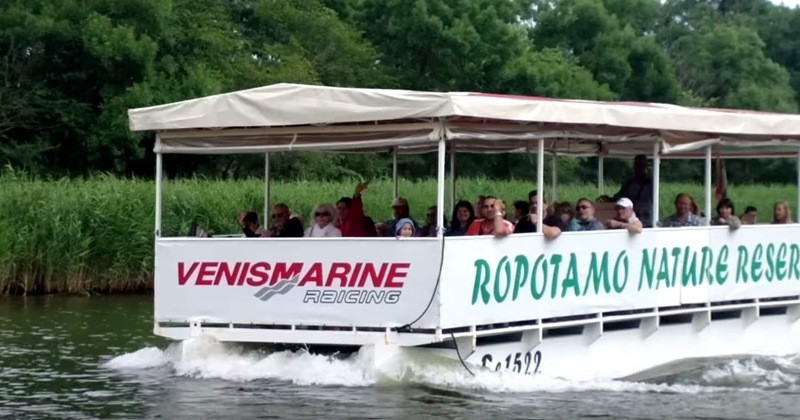 On July 28, VAS confirmed the preliminary execution of the order of the Head of RIEW Burgas for the immediate suspension of all activities related to the tourist service “Ropotamo Boat Tours” in the natural reserve “Ropotamo” provided by “Venis Marine” LTD. This was done by order № 9075 from July 27, 2015, in the administrative case № 7876/2015 on the docket of the Supreme Administrative Court. It upheld order № 1210 from April 29, 2015, administrative case № 858/2015 of the Administrative Court in Burgas. The preliminary execution of the order was motivated by the need to protect particularly important State or public interests and not allowing activity without legal basis for it. The environmental inspectorate has asked the company to vacate the exclusive State property in the “Ropotamo” reserve and all facilities it has occupied illegally, reported MEW’s press office. The outcome, whatever it is, is unlikely to occur in the middle of the most lucrative period for thugs’ boat tours. Lawlessness reigns, while the inability of the State to preserve and protect its own natural reserves of arbitrariness is unacceptable. The only conclusion for the public consciousness is that the State itself, an EU member, is implicitly, but consistently ruled by gangster groups and interests.